An Intellivision II Master Component with attached Intellivoice Speech Synthesis Module and cartridge. The inside of a 1981 Mattel Electronics Intellivision catalog, showing the original Master Component and various boxed games in their respective Network colors. Closeups of the infamous Intellivision controller. Despite allowing for an impressive 16 possible movement directions, the control disc was often criticized for its awkwardness with many games. Many add-ons of dubious value were created to purportedly enhance the control disc's functionality, like the Intellivision Attachable Joysticks shown to the far right. A page from a 1980 Mattel promotional flyer advertising the supposedly forthcoming Intellivision Keyboard Component and some of its software. An Intellivision II with ECS module, keyboard and music keyboard, along with an Intellivoice module. While certainly not the most powerful system pre-The Great Videogame Crash, the Intellivision's visuals and sound at their best could hold their own against any other system of the time. 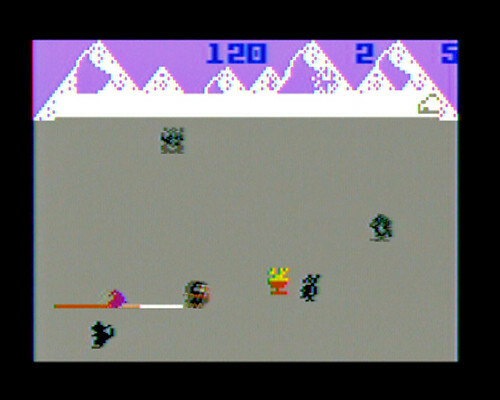 A direct screenshot from Thunder Castle is shown, which was completed a few years before its 1986 release date. Sports games were a system staple, but several excellent shooters also appeared on the Intellivision, including Imagic's Demon Attack (1982). Thin Ice (1986, but finished earlier), was a fun interpretation of the little known Data East arcade game, Disco No.1 (1982), replacing the disco dancing boy with Duncan the Penguin. The Intellivision was home to a number of dungeon crawling games, including Tower of Doom (1987), which featured multiple player characters to choose from and 10 different adventures. Imagic released several original games for the Intellivision, including Safecracker (1983), shown here, casting the player as a spy attempting to recover various items. The advanced ECS-only World Series Major League Baseball (1983) took a diferent visual approach than other Intellivision baseball games, with multiple camera angles versus a single overhead view. The INTV System III featured nearly the same design as the original Master Component from Mattel. The Intellivision can be an easy and fun system to collect for with a variety of loose and boxed games readily available for purchase and play on the various systems. 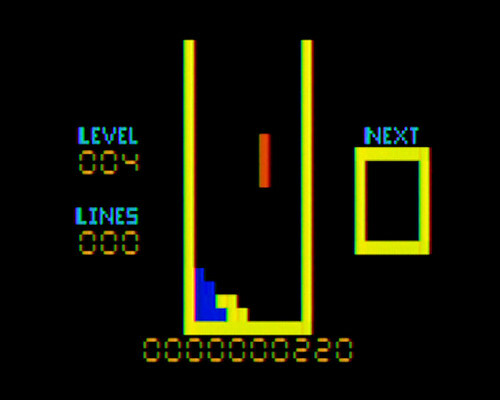 Joe Zbiciak's Tetris clone, 4-Tris (2000), is one of a handful of modern homebrew titles for the Intellivision. The Intellivision had new games in development right up to the closure of INTV, with the unfinished classic computer conversion of Choplifter!, shown here, and the finished, but unreleased, Deep Pockets: Super Pro Pool & Billiards, both featuring 1990 copyright dates. Awesome! This article come at a great time as I will soon be receiving an INTV2 unit, I know it's not fully compatible but I like the smaller styling of the revised unit. I was wondering if it was compatible with the voice module and it seems to be according to your pics! about the add-on sticks? Also I am really curious, what is up with those creme colored looking controllers, they look the same but were they made by someone else? Are they any better? What do you recommend regarding controllers since mine are detachable? It absolutely is. There's nothing the Intellivision II can't do, other than play four games, which if I recall I might have mentioned in the article, but if not, they're (again, if I recall completely) the three Coleco games and Mattel's Electric Company game. In fact, the Intellivision II is the only model that can make use of the Atari 2600 adapter without modification. The creme-colored ones are from the Sears version of the system I think. They're actually the same as the original Intellivision model's, which are superior to the Intellivision II's (better build quality and less pain). Frankly, in any case, there's not much you can do about the controllers (there is no availability of third party options), so your best bet is to enjoy them as they were meant to be, warts and all. I don't even use those add-ons that I have as they give inconsistent performance and really push on the discs when you put them in. The games I mention in the article are more or less the good ones. It actually has a very strong library, considering, so it's very difficult for me to think of any outside of the usual candidates, which are numerous. Great RPGs, great sports games, great shooters, great strategy games, great voice games, etc. The system is probably so relatively underrated because of the awful controllers, with few games honestly benefiting from the disc control. Great article -> some gameplay videos? Kudos to you guys for writing such a nice article! How about some game-play videos? Thanks for all the great comments, guys. Although Bill did the lion's share of the work here, I am still proud that I was able to contribute to such a definitive piece. I think I actually owned an Intellivision for a brief period in the late 80s or early 90s. Seems like I picked one up at a garage sale. Unfortunately, the unit was too badly used to be of service; seems like the controllers were nearly dead. Anyway, it was always an interesting system and unfairly obscure compared to the coverage for Atari VCS or NES. 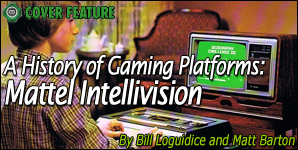 Just type Intellivision into Youtube for a treasure trove of related material, hell I could watch all day! Only 4,000 of the Keyboard Components were manufactured and those were only sold in limited test markets. When Mattel Electronics decided not to release them nationally, they recalled all the ones sold for a full refund plus free products. Those who wanted to keep their Keyboards had to sign a waiver stating that they understood Mattel would not support the unit nor publish any more software for it. To find a working Keyboard Component (with its original box!) is one of the rarest finds in video game collecting. to seriously tinker with the item - opening and taking pictures for example. It'll be locked and collect dust in a vault. So, it's not a total loss. Again, with only about 4,000 produced and many successfully recalled and many others no doubt trashed, there's probably less than a dozen of them in active circulation. So yeah, it would be great to have more active "discovery and analysis" out there, but at least we have a few things.